This one page document gives a brief summary of CWPPRA’s mission, goals, activities, accomplishments, and challenges. This booklet explains the basics of CWPPRA, covering funding, project selection, strengths and successes, as well as various other areas. Partners in Restoration" is a 25th anniversary coffee-table document that highlights the Coastal Wetlands Planning, Protection and Restoration Act (CWPPRA) efforts. Learn more about the various types of coastal restoration projects implemented in Southern Louisiana. Partners in Restoration is a colorful look at different project sites offering an insider’s look at what has resulted from five federal agencies and the State of Louisiana working together to save and protect Louisiana’s ecosystem and economy. This document explores the restoration efforts within the Barataria-Terrebonne National Estuary. The Residents' Guide was developed to promote awareness and good stewardship of the great natural resources of the estuary. This magazine is currently published twice a year to help the public better understand the work of CWPPRA (the Coastal Wetlands Planning, Protection and Restoration Act). The issues are grouped by year. These posters help promote the CWPPRA program while showing Louisiana's wetland beauty. This e-newsletter is published six times a year and highlights the outreach efforts of the CWPPRA staff. The CRMS document is designed to assist the public in understanding and using the CRMS website. This paperback book was created to help people understand the Louisiana coastal wetlands are home to some of the most dynamic creatures on Earth -humans. The 24 page full-color book explains how the state's residents are uniquely tied to history, culture, and wetlands. The book answers the often asked question, "Why save coastal Louisiana?" The general public will find this wonderful book an easy read. Every three years, the CWPPRA program creates an evaluation report to be sent to the U.S. Congress on the effectiveness of CWPPRA projects. Learn about Louisiana's coastal restoration efforts through CWPPRA (the Coastal Wetlands Planning, Protection and Restoration Act). The videos provide you with information about restoration efforts in Louisiana. This brochure discusses the causes of Louisiana's land loss and gives examples of pro-active resolutions in coastal restoration. When completely unfolded this brochure shows a map of the land change in Louisiana and gives examples of CWPPRA restoration projects. When completely unfolded it is 22" by 17". 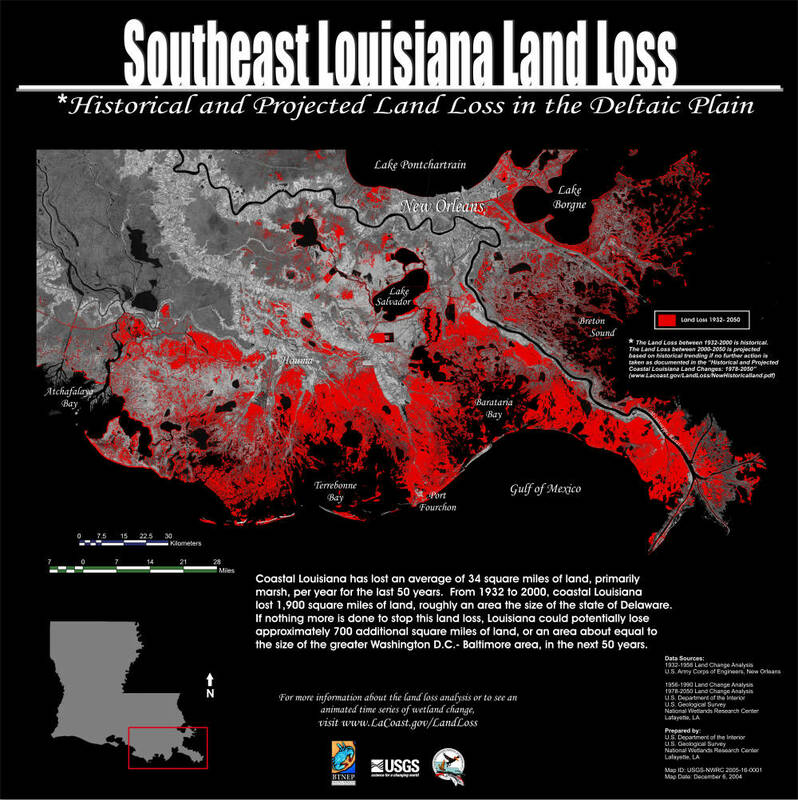 This map shows historical and projected Land loss in the southeast Louisiana deltaic plain. It measures 20" by 20". View various maps about coastal Louisiana. View a various list of Interpretive Topics about coastal Louisiana. The LaCoast.gov screen saver has fifty five images relating to Louisiana's wetlands.